ABBA finally took to the stage a little after 8.30, to a rapturous greeting from the soggy crowd of well over 20,000 people. As ABBA performed the first two songs, Tiger and Thats Me, the Showground arena was bathed in the constant strobe light of thousands of camera flashbulbs. The rain did little to dampen fans' enthusiasm, though there was concern when Frida slipped over during Waterloo. Luckily she suffered only minor injuries, and no doubt great embarrassment, and the concert continued. ABBA performed many of their hits and a selection of songs from their four albums, including most of the songs from the recently released Arrival album. Each song was greeted by tremendous applause from the drenched but happy audience. At one point Björn said that "because you have all been waiting so patiently in the rain for us, we are going to invite you all back stage after the concert and shake hands with every one of you !" Understandably the audience went wild, though he then said that of course he was joking! ABBA also performed a new song written to introduce each member of the group, We Are A Simple Four Letter Word. Each member got to sing a verse about themselves, even Benny, while the other three interrupted with humourous interjections. The climax of the concert was what Björn introduced as a mini-musical, "The Girl With The Golden Hair", during which Agnetha and Frida wore identical costumes and blonde wigs, both portraying the title character. After an encore of one of ABBAs most popular songs, Dancing Queen, and a brief reprise of Thank You For The Music when the whole band lined up across the front of the stage to sing, ABBAs first Australian concert ended with a fireworks display, and thousands of ABBA fans (including this one) floated out of the Showgrounds after seeing their idols live on stage. After the concert my family returned to our city hotel, where my mother and I sat at the window watching men going in and out of the strip clubs of Kings Cross, while my sister, who had complained during the whole concert that she would rather have stayed home, slept. We returned home on Friday morning, unfortunately unable to stay in Sydney longer. Press coverage the following day was predictable ("Whoops! ABBAs Slip is Showing", accompanied by a photo of Frida on her hands and knees, "Agnethas Bottom Tops Dull Show" with mandatory photo of Agnetha's famous asset). The weather improved on Friday, and ABBA performed their second Sydney concert to a drier, but no less enthusiastic crowd. 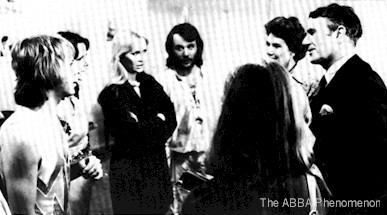 While ABBA were in Sydney Prime Minister lobbied Stig Anderson, and talked to the media, about getting ABBA to travel to Canberra during the tour to meet with Queen Elizabeth II, who was also in Australia. Unfortunately due to ABBAs tight touring schedule they were unable to accept any further commitments. 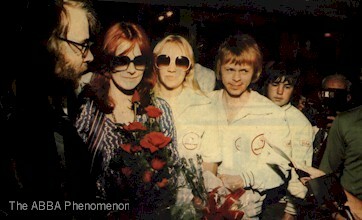 Saturday, March 5 saw ABBA travel to Melbourne. During the afternoon ABBA were given a civic reception at Melbourne Town Hall, after which they made an appearance on the Town Hall balcony, greeted by over four thousand fans below in Swanston Street. That night ABBA performed their first Melbourne concert at the Sidney Myer Music Bowl. The capacity crowd of over 14,000 took over every available vantage point to see ABBA perform under clear skies, plus another 16,000 crowded the Kings Domain surrounding the venue. Sunday, March 6 saw ABBA perform two further concerts at the Myer Music Bowl, at 2.30 p.m. and 8.30 p.m. Again capacity crowds saw ABBA perform. Unfortunately due to Björn suffering from a bout of food poisoning some songs were cut from the Melbourne concerts. After a well-earned rest on Monday, during which Benny, Frida and Agnetha cruised on Port Phillip bay while Björn rested, ABBA travelled to Adelaide on Tuesday, March 8. They performed their only Adelaide concert that night at West Lakes Football Stadium, where 21,000 fans inside the stadium and another 10,000 outside in the car park enjoyed the concert. On Wednesday ABBA travelled to Perth for the final stop of the tour. ABBA performed five concerts at the Perth Entertainment Centre, two on Thursday, March 10 at 6.00 p.m. and 9.00 p.m., one on Friday, March 11 at 8.00 p.m., and two more on Saturday, March 12 at 3.00 p.m. and 8.30 p.m. The first Perth concert was interrupted when a bomb threat was received and the arena had to be evacuated while police did a thorough search. Eventually the audience was allowed to return and the concert continued. As these were the only indoor concerts on the tour much of the filming and recording for ABBA The Movie was done at the Perth concerts. 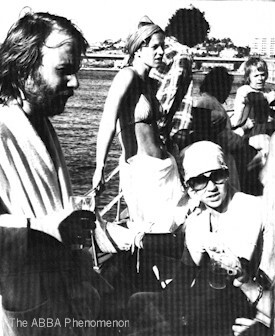 During their time in Perth ABBA had a chance for a break and cruised on the Swan River. Finally the tour was over, and ABBA departed from Perth at 7.30 p.m. on Sunday, March 13, to return home to Sweden for some well-deserved rest and to begin work on what would become ABBA The Album and ABBA The Movie. During their fourteen days in Australia ABBA treated over 140,000 people to 11 spectacular concerts that will live on in the hearts and memories of their fans always. A greatly expanded version of this article appeared in the ABBA Australian Tour 20 Year Celebration souvenir program.